As a newbie in the Acrylic Paint department, I have been struggling with the quick dry feature of acrylic paint. 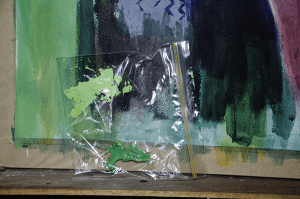 I think I have a great solution – “sandwich bags”. It is easy to mix too much paint when you are glazing colours. You mix your colour and then add acrylic medium and suddenly you have a ton of paint that is just going to dry out. I have been putting the mixture in a baggy and sealing it up. When I need a small amount of the paint for the next glaze, I can scoop out a bit with my palette knife and thin or tint it further. The baggies can be reused as you can wash them out when done. You can easily see your colour mixes in the bag as well. The baggy has another advantage. As you can see in the photo, the baggy can be placed again your work or against the colour you are trying to match and allows easy comparisons. In this baggy, there are two green mixes and because of their high viscosity, it is easy to have more that one colour in a baggy. I know there are wet or stay-wet palette out there that I have not tried yet, but the baggy works really well.